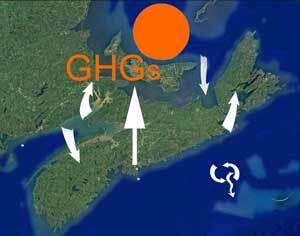 ← Nova Scotia forests, forestry and GHGs 2: Who accounts for the EU’s emissions from bioenergy generated from imported chips? Copy of Notification as posted on Woods and Waters NS this am. 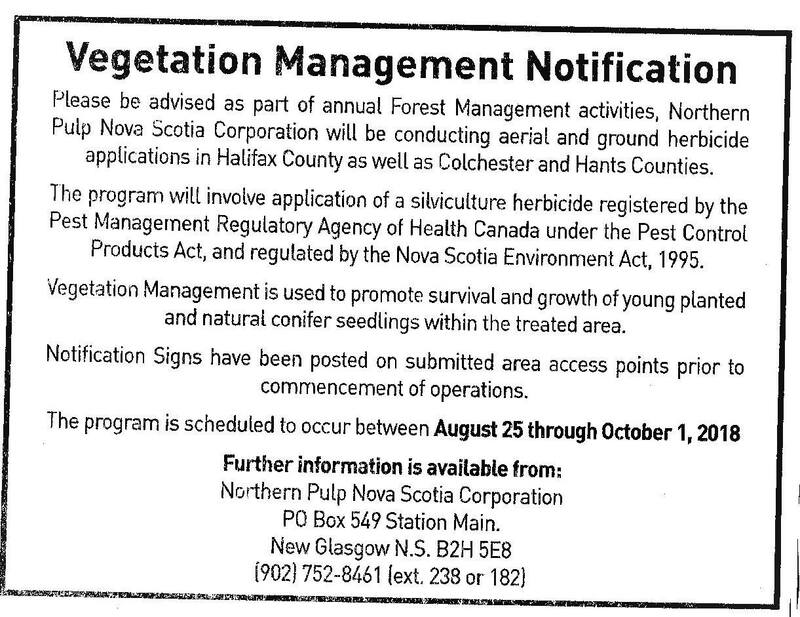 Woods and Waters NS has posted a copy of a notice about herbicide spraying by Northern Pulp, but as of yet, there is no information under Pesticide Applications Approvals on the NSE website. Funnily enough, coincidence or not, I had just made a comment on WWNS about the lack of info on the NSE site about 2018 spraying and begun this post and within minutes, six 2018 Pesticide Approvals appeared on the NSE website. So the info is now there for MacMullin, JD Irving and Century Forestry Cos in Antigonish, Guysborough, Pictou, Colchester and Cumberland Cos, but at as I write, nothing for Northern Pulp spraying in Halifax, Colchester and Hants Co. The Approvals give the PIDs but do not state whether they are on Crown or Private Lands; presumably those posted are all on private lands. There does not seem to be any mechanism for appealing the permits. (View NSE Q&E). There is a Q&A section about herbicide spraying on the NP website, but I can’t find anything about locations times etc. With the extra hot weather, which may represent faster climate warming than even that previously predicted, we might wonder why we are still borealizing our forests with the help of herbicides. I had expected to see the NP approvals on the NSE website by the end of the day, but they are not. I guess the attitude is ‘nobody cares or needs to know because they can’t do anything about it anyway’ or something like that. Good to have Margaret Miller, a firm believer in herbicides, back in NSE. Comment by AF: people with saws can do the same job as spray and leave nice hardwood mixed in. i would realy like to know the price per hactare to spray ?…if the mills realy wanted to help my community they could end there spray program and pay people with bushsaws to thin blocks not only would this put money back into the local economy it would also help with there public image. And some other comments under the WWNS original post about the NP spraying illustrate that anything around herbicide spraying is likely to be a hot topic. Some would say an “emotional” topic…to which I would respond, yes it is because we (our governments, regulators etc) don’t actually address the topic rationally. RR: Any maps/descriptors available showing spray areas? BW: Also note that they don’t actually name the products they will be spraying. I think that has to be posted on any signage at spray sites. I wonder if they’ll bother to do so? — SB: What about people with respiratory diseases, COPD, asthma, allergies, etc.? HHW: And people wonder why there’s such an increase in chronic illness. KO: Why is it big deal if NP wants to do some spraying ..? Everyone is alright with the farmers spraying for bugs and weeds .. .. it’s alright for a farmer to spray to protect there crops .. why is this any different..? –Woods and Waters Nova Scotia Ah, the old farming / forestry / crop come back.. No one said everyone is alright with farmers spraying. But at least we can wash off the crap before eating it. And there’s a lot more to it than that. It’s the mono-culture plantations being grown as opposed to a biodiversified ecosystem based forest. –BKH: It’s also the fact that they come in with helicopters for a “controlled spray” and leak the poison into the waterways. –BS: Tree huggers are the worse!! –CM: BS.. worse than those who spray poison? Trees have incredible energy. Maybe if more people hugged a tree, they might understand the insanity in cutting down huge swaths to make paper to wipe our arses. TJF: We all just have to put our foot down and stand up and fight for mother earth stand against the goverment and there stupid logic..
TLLP: I posted a notice for spraying of the railway system too last week. I do not consent! I suggest we all contact our MLA’s and let them know we Do Not Consent!!! And from DW separately: Last year some aerial spraying was being done prior to the advertised date of beginning and on a breezy day . I wonder what they will do this year ? Root uptake herbicides such as Velpar L (Hexazinone) and Princep Nine-T (Simazine) are most commonly used for weed control before planting. These are applied in early spring when plants begin to grow. They work best if applied to just before light rains which moves the herbicide into the soil where it is taken up by the roots. Leaf intake herbicides such as Vision (Glyphosate) are usually applied in late summer (August-September) when softwoods have hardened off and are dormant. Hardwoods and other herbaceous plants are still actively growing and are killed by the application of Vision. This releases the conifers from the overtopping cover of weeds during the next growing season. Chemical weed control reduces, but does not eliminate, the competition for light and space and gives the planted seedlings room to grow. 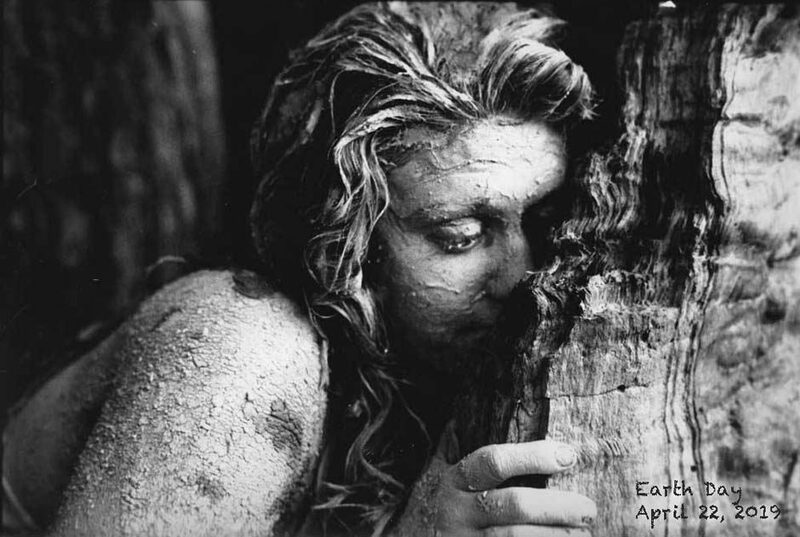 This entry was posted in clearcuts, Climate Change, herbicides. Bookmark the permalink.